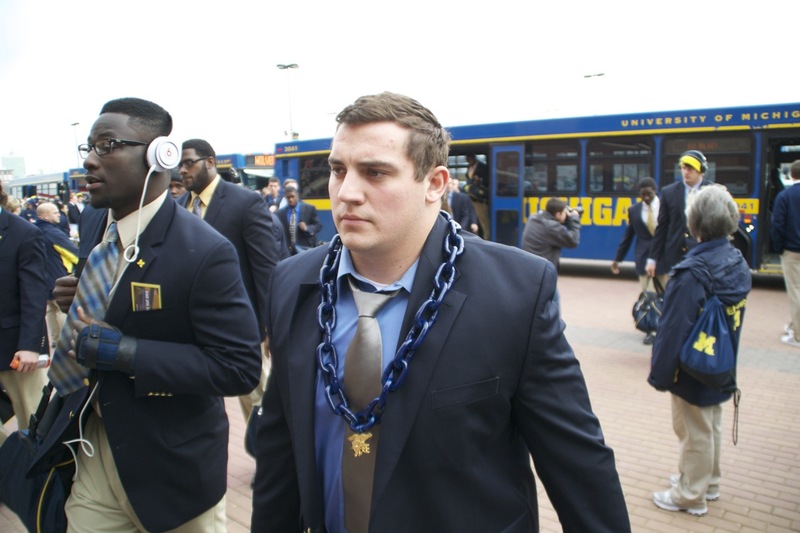 David Molk prior to the Ohio game on Nov 26th. ANN ARBOR, Mich. -- Fifth-year senior center David Molk (Lemont, Ill./Lemont Township HS) of the University of Michigan football team has been named the recipient of the 2011 Rimington Trophy, announced Thursday (Dec. 8) during the ESPNU Home Depot College Football Awards Show at The Walt Disney World Resort in Lake Buena Vista, Fla. Molk becomes the second U-M player to win the Rimington Trophy, named after former Nebraska center and two-time All-American Dave Rimington. David Baas shared the award in 2004. "I am truly humbled to be the Rimington Trophy recipient," said Molk. "It's such an honor considering all of the great centers around the country, including the other finalists. It's an individual award, but it's a credit to our offensive line, our team and our coaching staff. I'm proud to represent the University of Michigan." The official Rimington Trophy presentation will be held Jan. 14, 2012, at Rococo Theater in Lincoln, Neb. Also during the ESPNU Home Depot College Football Awards Show on Thursday, Molk also was named a First-Team All-America by the Walter Camp Foundation. Winning the Rimington Trophy and earning First-Team Walter Camp All-America recognition comes one week after Molk earned All-Big Ten Conference first team honors by the league's coaches and was named the inaugural Big Ten Rimington-Pace Offensive Lineman of the Year. Molk, a four-year starter, has opened 41 career games at center for Michigan. A senior captain who started all 12 games in the 2011 regular season, he helped lead the Wolverines to a 10-2 record and the Sugar Bowl. Molk and the offensive line helped pave the way for two 1,000-yard rushers (Denard Robinson and Fitzgerald Toussaint), the first time since 1975 Michigan has had two players eclipse 1,000 rushing yards. The line also allowed only 15 sacks in 2011, while the offense averaged 34.2 points per game, (2nd in the Big Ten), 235.7 rushing yards per game, (2nd in the Big Ten and 12th in the FBS), and 423.1 yards per game (rd-best in the conference). Molk is set to make his 26th straight start in the 78th annual Allstate Sugar Bowl against Virginia Tech on Jan. 3, 2012 at the Mercedes-Benz Superdome in New Orleans, La. The game will be televised on ESPN at 8:30 p.m. EST.